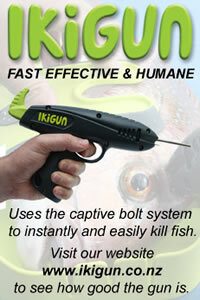 http://www.ikijime.com | HUMANE KILLING OF FISH - FRESHWATER - ESTUARY - OFFSHORE Maximum quality, minimum fuss. iki jime Fish Finder - Search for your fish and identify the spike point. An important part of fishing today is releasing fish and only taking home what you need for a feed. Even so, recreational anglers harvest millions of finfish each year. Anglers can improve the welfare of fish in many ways, not only by observing best practice fishing methods, but by protecting and restoring fish habitat and water quality (see ozfish.org.au for more details), by obeying fisheries regulations, and of course by dispatching their fish humanely. For more details and interactive learning tools that reveal the brain location for a wide range of fish species in Australia and around the world – please use the iki jime Fish Finder Search Bar at the top of this page. Enter your region (Australia, New Zealand, North America, South America, Europe, Asia or Africa), and state or province first, then select the water type (freshwater, estuary or offshore) and then select the appropriate fish group. Select the fish you want from the dropdown list and hit “Go Fish”. Alternatively, you can use the “Advanced Search” function to search for fish by taxonomic group. Governments or other institutions wanting to increase the number of species in the database for their region, should please contact us on info@ikijime.com. If you’re out on the water remember to download version 2.0 of the IkiJime Tool Apps from the ITunes Store or Google Play. Ikijime Tool Lite on ITunes or Google Play is the free online version that allows limited access to a static fish database. Ikijime Tool ( ITunes or Google Play) is the online version with unlimited access to the full fish database, while for ultimate speed and performance, Ikijime Tool Extreme ( ITunes or Google Play) is the ultimate Ikijime App that retains full database access and fastest lookup performance even in remote places out of phone or internet range. And don’t forget to like Ikijime Tools on Facebook. Whether you’re out on the water or before you go out, take the time to learn the following four tips for humane dispatch of finfish and improve not only your fishing skills, but the eating qualities of your catch. Time is of the essence. Allowing a fish to thrash around and die slowly in air or a bucket of water is unacceptable. It causes unnecessary stress to the fish, reduces the eating quality and shortens the storage life of the flesh. If you choose to kill a legal sized fish, it should be done quickly – preferably within a minute of it being caught. Either a firm knock on the head or spiking of the brain (called iki jime or ike jime – pronounced “iki jimi”) will kill fish immediately. These are the two preferred killing methods endorsed by Australia’s National Code of Practice for Recreational and Sport Fishing. Some basic tools are required to kill fish humanely. To knock a fish on the head, use a wooden club or ‘priest’ with sufficient weight to render the fish immediately unconscious. The iki jime procedure can be done using either a sharp knife, a sharpened screwdriver, or by using specially designed iki jime tools that are becoming available at all good tackle shops. Knocking fish on the head with one or more sharp blows is the easiest method of humane killing. The iki jime process requires more precision, but results in the lowest levels of stress to the fish and improves eating quality. Method: Quickly and firmly insert the spiking tool into the areas indicated, and wiggle the tool around to destroy the brain. When performed correctly, the fish will be killed immediately and its body will go limp. Diagrams on this website pinpoint the exact location of the fishbrain (shown by the white markers) of over 140 of the most popular freshwater, estuary and offshore fish species targeted by anglers in Australia, New Zealand, SE Asia, the Americas, Europe and Asia. To find your fish, please use the Ikijime Fish Finder Search Bar at the top of this page. Enter your region and state or province first, then select the water type (freshwater, estuary or offshore) and then select the appropriate fish group. Then select the fish you want from the dropdown list and hit “Go Fish”. Alternatively, you can use the “Advanced Search” function to search for fish by taxonomic group. Once your fish has been appropriately killed by a knock on the head or iki jime, maximise the eating qualities of your catch by placing it on ice or preferably in an ice slurry (minimum two parts ice to one part water). Placing a fish in an ice slurry without stunning or killing it first is not necessarily stressful to many species, particularly smaller fish from warm waters. However, this method may not be effective or suitable for large fish and/or cold-adapted species (e.g. trout). Bleeding your fish immediately after stunning or iki jime will improve flesh quality and storage life, particularly if the fish is bled then immediately placed in an ice slurry. In some species of fish (e.g. whiting) decapitation or breaking the neck can result in immediate death (and therefore minimal stress), however for other fish species death may not be immediate using this method. Use the seach dropdown list above for more details and interactive learning tools that reveal the brain location for a wide range of fish species. Download a PDF brochure, print it out and take it with you. 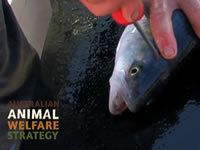 For assistance with identifying fishes, see fishesofaustralia.net.au. For information on size and bag limits, check out the website of your State Fisheries Department. We thank fishesofaustralia.net.au and Australia's various Fisheries Departments for some of the thumbnail images used to assist with fish identification on this website and its applications, as licensed for use under Creative Commons Attribution 3.0 Australia. Thanks also to Michigan State University and Georgia Aquarium for generous donation of xrays of some US fish species.